Felicity was invited to talk on writing and publishing at the Ladysmith Literacy Festival on June 30th. Ndiphile Gule of Dancing Pencils and umSinsi Press went with her from Durban. 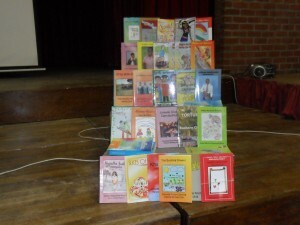 Here are some of the books by Dancing Pencils Club writers. A large audience in the Sports Stadium at Ladysmith enjoyed the Drama Presentation put on by the Zanendaba Storytellers. There were laughs and smiles and thunderous applause from this audience! After Felicity had made a brief presentation to the large audience at the Sports Stadium in Ladysmith, on the first morning of the Literacy Programme, Sandy Maharaj from the Libraries asked members of the audience to join Felicity in the Utilities Hall for a 3 hour right brain writing session. Several adult writers keen to get published, and a number of young very keen writers had a happy time unlocking their right brains. These children were delighted to hear that nothing would be criticised – not their handwriting, spelling or what they wrote. When reading out, the young lady in the pink and white striped shirt revealed that her dearest dream was to be an author! As Ladysmith Libraries will be training several Mentors of Dancing Pencils Writing Clubs, her dream could come true!